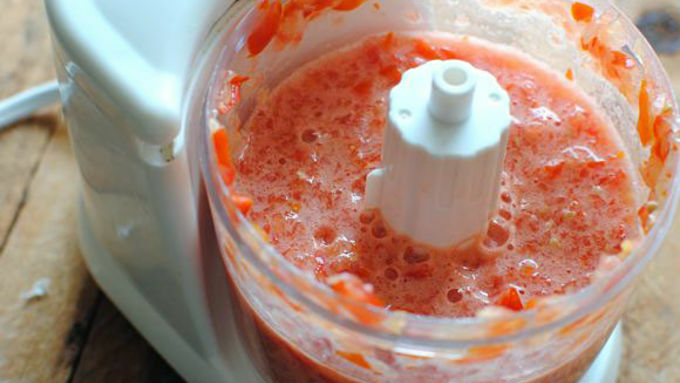 In a small food processor, blitz the tomatoes until smooth. Set aside. 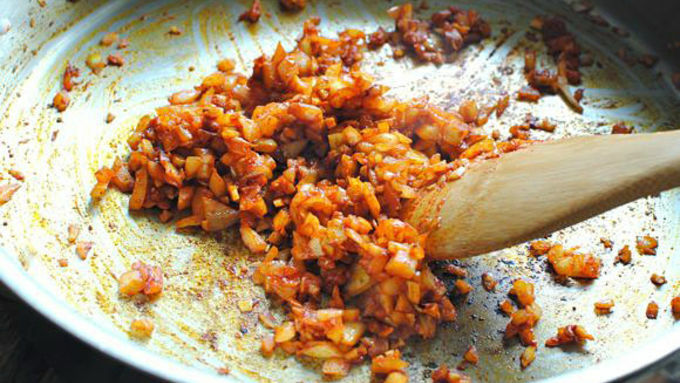 Heat 1 tablespoon oil in a paella pan, or a large straight-sided pan. Add the chicken sausages and cook until browned on both sides, 4 minutes. Remove from pan and set aside. Add the remaining oil to the pan. Add the onions and sauté 3 minutes, or until they start to soften. Add the garlic and smoked paprika, bloom 30 seconds. Add the rice and toss to coat with the onions. Toast 1 minute. Add the chicken stock and pureed tomatoes. Stir to combine. 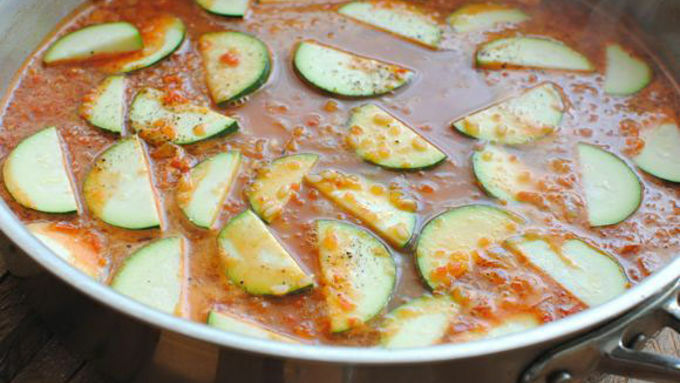 Arrange the zucchini slices on top of the rice, season with salt and pepper, cover the lid and simmer on medium for 20 minutes. 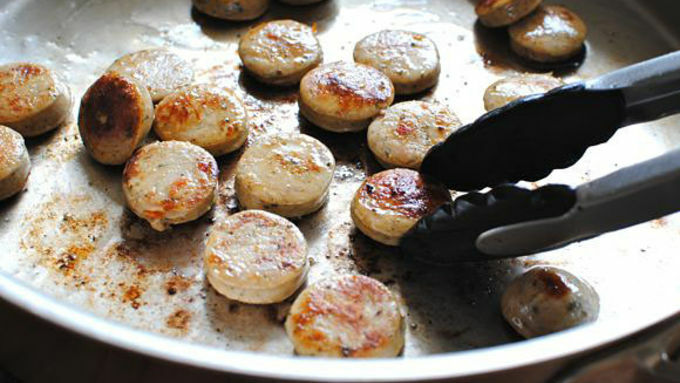 Remove the lid and add the chicken sausages (their accumulated juices) and shrimp to the pan. Sprinkle with a little salt and pepper, cover and simmer 3 more minutes, until shrimp is opaque. You should have a slight crust on the bottom. Lightly toss everything together. Spritz with fresh lemon juice and basil slivers. Serve immediately. You know the phrase "hakuna matata" and how it means "there are no worries?" WELL, did you know the completely authentic legendary end-of-summer phrase is actually "paella fer ya face-a?" It's totally true! 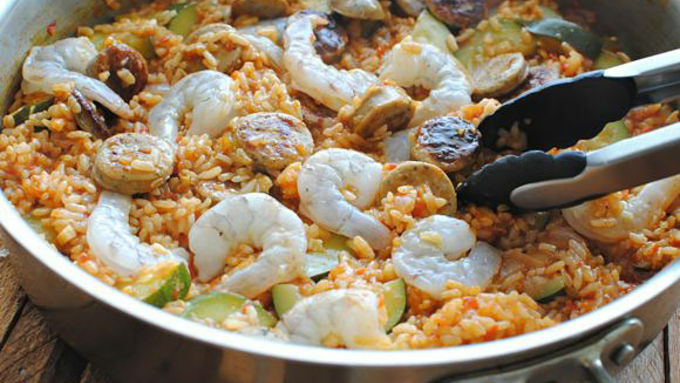 It means "you should definitely eat this yummy smoky Spanish rice dish with zucchini, shrimp and chicken sausages and live happily ever after, and dance around in a circle like a monkey." WHAT I AM SERIOUS. Hey, you just don't go messing around with ancient folklore. 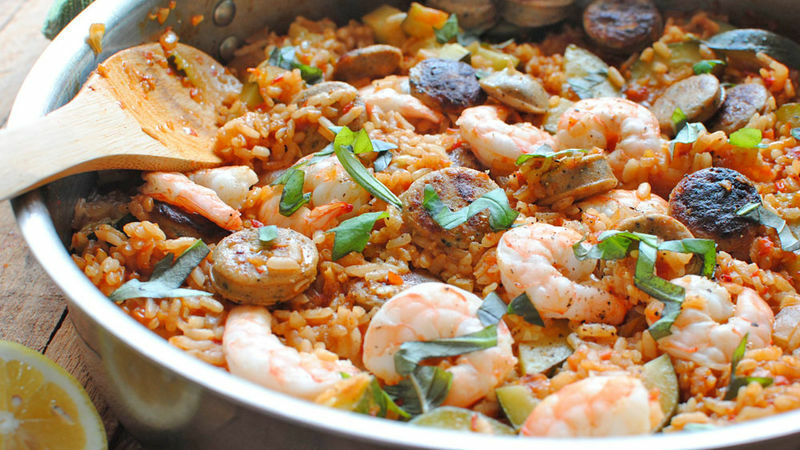 Grab some arborio rice, chicken sausages, shrimp, zucchini, smoked paprika, half an onion, some garlic, tomatoes and stock! Deez eez gonna be so good. Might I throw out that this would be awesome to make on the grill for guests this weekend? Yes, it would. And listen up. You squeeze half a lemon up in this piece and the stars of your heart will beam into the night. And hear this. You toss some basil slivers all up over this mother and the souls of the past will rise again. Okay that was weird. 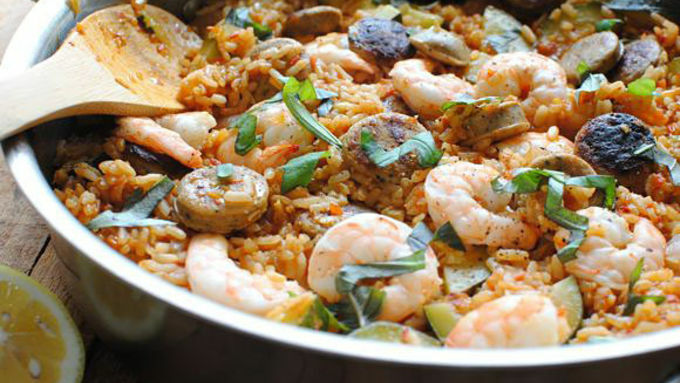 Paella fer ya face-a!